Also known as a sand clock or sand glass, an hourglass was invented in 3rd century Alexandria to measure the passage of time. Each hourglass measures the length of time by how long it takes for the sand to run from one end to the other. 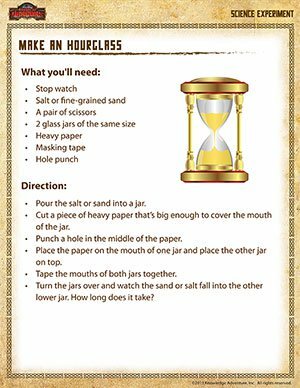 Use this free printable 4th grade science experiment to learn how to make a rudimentary hourglass. And when you're done, browse through these interesting science activities for all grades.